WILMINGTON, N.C. – Cape Fear Museum has been awarded a $5,000 grant from the Corning Foundation. Funds will be used to establish a Robots After School program. 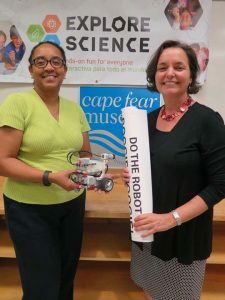 The Museum will offer four after school sessions for New Hanover County middle school students to nurture a lifelong enthusiasm for science, technology, engineering, and math (STEM). Students will build LEGO Mindstorms EV3 robots and LEGO WeDo ReadyGo kits featuring step-by-step instruction and encouragement from Museum educators through the building and programming of their creation. Grants from Corning Incorporated Foundation to local organizations and to selected national institutions support programs and projects in the sectors of education, arts and culture, and health and human services and, on a case-by-case basis, disaster relief. To positively affect the greatest number of people over the longest period of time, the Foundation follows a strategy of shared social responsibility with other “investors,” focusing on projects that demonstrate broad appeal and strong local support.